Posted on May 16, 2018 by Lisa B.
It’s time! 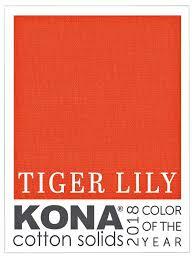 Bring your Kona Tiger Lily mini quilt to the meeting in May. If you can’t be there please send it with a friend or make arrangements to turn it in before the meeting. For your work to be hung in the exhibit it must be turned in by next Tuesday at the meeting. We’ll be learning about printing on fabric using stamps, potatoes and all kinds of fun objects using several different mediums. There will be paper to practice on and fabric for your final design. Feel free to bring your own fabric too! Registration for the July workshop with Lynn Carson Harris will begin this month. Nancy Powell will be presenting the second set of directions for the BNMQG Mystery Quilt that she has designed. There’s plenty of time to join in! Meet us at Christ Lutheran Church, 311 N Hershey, Normal IL. Social time starts at 5:30 and the meeting will begin at 6. Here’s what you need to bring! Modern show and tell items. Your HeartBeat quilt if it’s done. Refreshments if you signed up! Library book if you checked one out.